A very devoted homage that nevertheless brings back a golden era provided you lived through it the first time. Legend of Grimrock is difficult for me. It's a love letter to Dungeon Master, one of my favourite games. It's difficult to pretend to be objective when you're being poked so stubbornly in your nostalgia pipe. I was gurglingly well-disposed to Grimrock, even before I started playing it, so this review runs a real risk of becoming either a nauseatingly self-indulgent gush or kneejerk backlash. Let's just describe it. You control four criminals, their crimes absolved by a simple process – they're thrown into Grimrock's dungeons and left to die. The default party is a preset team of two Fighters, a Rogue, and a Mage. They occupy a neat tile, and the two-by-two formation puts the fighters in the front row – the Rogue lobbing bombs and shuriken from the back row, and the Mage using a 3x3 grid of runes to cast the spells he discovers in the pit. Grimrock is full of monsters and puzzles. Snails are your first foe, easily killed and dropping precious food. They're soon replaced by fatiguing skeleton soldiers, poisonous spiders and furious shrubs. Each feels slightly different to fight, although the system is pretty restricted. Fighting well is a matter of sidestepping, and learning the small quirks of each enemy. Crabs can move sideways. Ogres can turn and attack in the same move. They're also quite easily exploitable – any single enemy, no matter how tough, can be dominated by a series of cowardly stab-retreats and sidesteps. That's why Grimrock throws many enemies at you, and narrow corridors with alcoves whose only purpose can be to trick you into backing into them, and getting cornered. Save often. It's your choice where your party-members' level-up skill points are invested. They're sparsely awarded, so you'll need to choose your specialities early. Spread your Fighters across different kinds of weapon. Choose whether you want the Rogue to chip in with melee from the back or specialise in throwing. With the Mage, it's more a matter of finding where the spells you want to cast are unlocked. For a long time, food supplies are painfully finite and easily wasted. Starvation doesn't kill you, but it stops your health and energy recharging, so you're prone to weak swipes and long battles. You could choose to starve your characters and only eat before a fight. It's not kind, but it's efficient. Combat suffers slightly from the graphical upgrade. 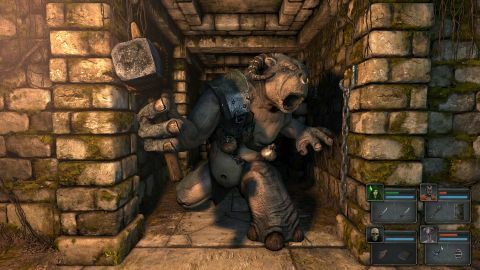 Grimrock animates the move between tiles, leading to a situation where you might find your path blocked by a creature that's only just decided to go where you wanted to be. However, you can attack during the move between tiles, and your enemies can't – leading to a new 'cheap but satisfying' tactic. The simple enemy AI, the exploitability of it, and the way the basic mechanics of the dungeon work is how Grimrock most effectively brings back the old feeling of Dungeon Master. You're up against it, so you use every trick in the book. The puzzles, riddles, secrets and mechanics of the dungeon weave a decent challenge from a very limited toolbox. Switches, levers, pressure plates and teleporters make for familiar and intuitive problems – but Grimrock squeezes everything out of them. You'll get that sullen feeling of walking around in circles, then stopping to do something else until your subconscious throws up a couple of suggestions. You'll learn not to turn Grimrock off, because you know you'll be back. So, would I recommend Grimrock to a Dungeon Master fan? Of course. Just be prepared to forgive how very similar it is. Would I recommend it to a total newcomer? Again, yes. I envy you. This is all new to you. Get in there.